IFAD West and Central Africa Division has been working to develop improved processes to enable us to more systematically learn from our project experiences. As part of this effort, we are experimenting with the ‘Capitalisation’ technique, and hosting four Capitalisation workshops in the region in 2011, each revolving around a chosen theme. The workshops are a way for us to bring together projects which are implementing similar activities as a ‘learning group’ and engage them in a collaborative process where they can share and document findings and identify effective and replicable practices and innovations to benefit the portfolio as a whole. The approach combines face-to-face interaction with writing skills development in documenting experience aiming to producing information and knowledge materials through participatory methods. 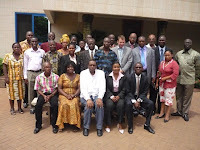 The first workshop was held in January on the topic of Youth, in Benin linked to GC 2011. Five projects from five countries participated in a 8-day workshop in Porto Novo. The set of projects experience has been published in FIDAction special issue on youth. Building on what we learned from this, we are holding the second workshop, “Capitalization Workshop on Rural Enterprises Development: Challenges, Progresses and Lessons Learnt” in Accra, Ghana, from 16 to 24 May 2011 bringing 4 countries (Ghana, Ma dagascar, Rwanda and Senegal) together in an effort to share concrete action experiences following projects implementation. The main objective of the workshop is to learn lessons across the two regions to understand the constraints and challenges in rural enterprises and generate knowledge that can contribute towards improved programme design. Participants from IFAD HQ are Benoit Thierry, CPM for Madagascar and Zoumana Bamba, KM Officer for West and Central Africa Division. - To stimulate knowledge sharing on rural enterprises by practitioners, building on lessons learnt from the implementation of concrete project actions by countries across the two regions of Sub-Saharan Africa. - To document lessons learnt to share, good practices, success factors, considering the different steps of developing business development services in the rural areas. - Create a regional practitioner learning network on rural enterprises. a) Presentations followed by discussion of key issues, accomplishments, challenges, lessons learned and good practices from countries - The presentations will focus on key topics to be defined by the participating projects, and also share the aims, methods, results and lessons learned from the projects. After each presentation, participants will have the opportunity to ask questions and discuss results and lessons learnt. b) Field visits and interviews of beneficiaries in Ghana - The findings will be presented to participants on a panel discussion with a select number of beneficiaries. c) Writing sessions taking full advantage of the expertise of the various participants. The writing sessions will capture (document) specific lessons learnt and experience from each of the project. Knowledge products of lessons learned from each project will be posted on FIDAfrique portal and featured in regional newsletters, and shared via regional portfolio review reports. At the opening session, REP Coordinator, Kwasi Atta-Antwi, said the Project has gradually evolved a sustainable institutional framework that is spearheading MSE development in the districts and local communities in the country. He explained that even though the Project has accumulated vast experiences, confronted several challenges, innovations and lessons learnt from Project implementation, a systematic approach to document these experiences, challenges and innovations only started in 2008 after the Project’s Mid-term Review. Country Portfolio Manager of IFAD, Ulac Demirag, said small businesses have a critical role to play the development of sustainable economic growth and eradication of poverty. He mentioned that IFAD’s investments in Ghana are designed to create employment and wage jobs for the rural poor particularly the youth to enhance their livelihoods. Mr. Demirag announced that IFAD, since 1980, has so far supported projects and programmes in Ghana to the tune of US $ 490 million benefiting about 3.5 million households. This he said is in the area of developing pro-poor agricultural value-chains and also supporting Government to develop a vibrant rural MSE and financial sector through the Rural Enterprises Project. He added that IFAD has already earmarked more than US $ 30 million to up-scale the Rural Enterprises Project into a national Programme which is estimated at US$ 185 million. The readiness of the Government of Ghana to support the programme with a large amount of own resources demonstrates its strong commitment, and represent a key success factor. Minister of Trade and Industry, Hanna Tetteh, in an address read on her behalf by Director SME at the Ministry of Trade and Industry, Johnson Adasi, said the Rural Enterprises Project has so far delivered very good returns on the huge investment that have been made over the years. She mentioned the sustainable district-based institutional structures for rural businesses development, namely the Business Advisory Centres and Rural Technology Facilities. Ms. Tetteh explained that these efforts have translated into the creation of employment opportunities for especially rural poor through skills training, strengthening of existing enterprises, promotion of appropriate technologies, improvement in access to credit and the improvement in market access etc. She said the workshop provides a unique opportunity to identify relevant and useful experiences to share with other projects in Ghana and the wide community of rural development practitioners. Please join us in adding your views and experiences on promoting Rural Enterprises Development. Your insights, experiences and comments are very welcome.